Don Coscarelli's 1979 low budget, surrealist horror flick PHANTASM is one of my all-time favorites. Sadly, I have been considerably less enamored of the sequels: the compromised, big(ger) budget semi-remake PHANTASM 2 had its moments, but came up short. And the back to basics low budget third and fourth installments seemed more interested in wallowing in mythos and backstory than in freaking audiences out. Now comes what is being billed as the final installment in the series, PHANTASM RAVAGER. And while Coscarelli is involved as co-writer and producer, this time he lets David Hartman sit in the director's chair. It still can't measure up to the original, but it's an improvement over the other sequels, and most importantly for fans who, unlike me, have enjoyed the whole series, a fine send-off for the characters. As is the case with all PHANTASM movies, the plot is convoluted and confusing, and doesn't entirely come together in a logical way. Series mainstay Reggie (Reggie Bannister) hops in and out of several different realities – a present day existence where the previous films are very much real in which Reggie meets a woman named Dawn and does battle with a couple of the deadly silver balls that are a hallmark of these films; another present day in which Reggie is a patient at a nursing home suffering from dementia being visited by a now grown-up Mike, the young hero of the first film (and sequels). His roommate is a decidedly unthreatening Tall Man; and finally, a post-apocalyptic future where series baddie The Tall Man has enslaved most of the earth except for a small group of freedom fighters (among them, Mike). I don't want to give away any spoilers, but I will say that some other actors from past Phantasm films have small parts as well. Reggie is an everyman hero in the Bruce Campbell mold. He's a little less goofy and probably a bit smarter than Campbell's Ash, but they're definitely cut from the same cloth. Bannister plays the role like it's second nature to him, never coming across as less than convincing no matter how ridiculous the plot or his dialogue gets. Scrimm was in his late eighties as this was being filmed, so he doesn't get too physically active. Nonetheless, he still cuts an imposing figure, delivers his lines with suitable menace, and when standing there with a sneer on his face looks about the same as he did back in 1979. Heck, with just a little hair dye so does Reggie, for that matter. Strictly on a surface level, this is "B" horror the way I imagine most "Phans" will like it. There's gore, action, flying silver balls, evil Jawas, and of course the classic music. Beneath the surface, the film works as a nice companion piece to the original. Where that film was concerned with the fear of losing other people, RAVAGER seems more about the fear of losing oneself. With Scrimm having passed away this year at the age of 89, and the rest of the original cast getting up in years as well, my guess is this really is the final film in the series. 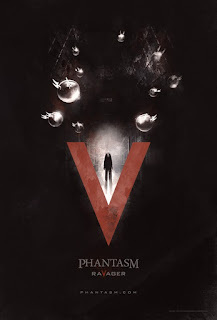 RAVAGER may not achieve the classic status of the original PHANTASM, but for the fans who have stayed with this unique horror franchise through thick and thin, it's a satisfying way to say goodbye to these characters they've come to love. 2 ½ out of 4 stars.